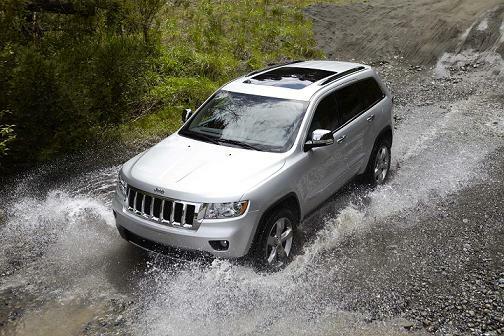 Few products this year carry the immense pressure now borne by Jeep's all-new 2011 Grand Cherokee. It is the first all-new product introduced since Chrysler and Fiat became one. Thus, many people, fairly or unfairly, are looking at this vehicle as evidence of what we can look forward to from the company in the months and years to come. That's a tall order to fulfill. But if Chrysler officials have been holding their collective breaths, they can exhale now. Just about everyone agrees that the new Grand Cherokee is a vastly improved vehicle with much higher quailty and fit and finish8 than its predecessors. Not that you won’t recognize it. The all new chiseled, angular shape still looks precisely like a Jeep, and it shares quite a bit of styling flavor with several recent Jeep concepts. One of our favorite features hands down is the new dual-pane panoramic sun roof , called CommandView, that reaches from the windshield clear to the rear of the Jeep Grand Cherokee. It‘s made up of two glass panels with power open/close sun shade. It provides plenty of light and gives the cabin an open, airy feeling. And if you are worried that it’s given up a millimeter of its vaunted off-road capability, you can stop worrying. There’s a new “Quadra-Lift” air suspension that can lift it as much as 4.1 inches from Park mode, to a maximum ride height of 10.7 inches. And you’ll have your choice of three 4 x 4 drive systems, including Quadra Trac 1,Quadra-Trac 2 and Quadra Drive II that includes rear electronic limited-slip differential. It also includes a feature almost never seen on anything but the most expensive SUVs like Land Rover: a Sele4c Terrain system that has five terrain settings to help you conquer just about anything. They include Sand/Mud, Snow, Rock, Sport, and Auto. And as you might expect, fuel economy is a big driver behind the all-new Jeep Grand Cherokee. Its powered by the long awaited new flexible fuel 3.6 liter Pentastar V-6, which provides an 11 percent improvement in fuel economy, offering up to 23 miles per gallon or 500 miles on one tank of gas. The engine’s other features include variable valve timing. It puts out 290 horsepower and provides 260 pound ft of torque. Of course, you’ll still be able to get the 5.7-liter, 360 horsepower Multi-displacement System (MDS) V-8 engine if you wish. And if you’re planning to tow a trailer, you will want to look hard at the new Jeep Grand Cherokee, since it has tow capacity of up to 7,400 pounds. But clearly, the thing that impresses us most here at Automobile Journal is the huge improvement in materials and presentation for the interior. 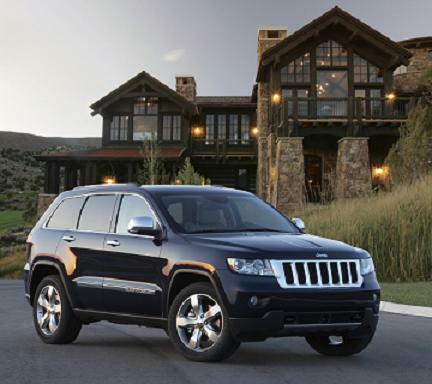 Now, we think the new Grand Cherokee should compete quite well with the top luxury models in its field. You couldn’t say that before. What’s really cool is that it maintains an all-American look. There are no European influences or Japanese flavorings to be found here– and that’s clearly a plus, and it should help distinguish the Grand Cherokee from some of its competitors. Jeep is wise to play up the American quality angle in its commercials on the new Grand Cherokee, it makes an excellent case that “Built in America” is back with bang, and it’s a force to be reckoned with in the marketplace. You’ll see premium soft touch interior material, including leather instrument panel and door trim on the Overland model, along with real wood and leather, heated steering wheel, heated rear seats, four way power lumbar controls, Parkview rear back up camera and a host of other features that make the new model entirely competitive at last. Other interior features include more storage space in the instrument panel, more space to get in and out, and over four inches of additional rear seat leg and knee room. And yes, the second row eat does incline. What we did find interesting that the new Grand Cherokee remains a five seat vehicle; that should prompt more comparisons with Lexus’ RX models, Cadillac’s SRX and the Lincoln MKX. Still, there’s such a demand for three rows that much less expensive products now feature it. It will be interesting to see how this all plays out in the marketplace. You’ll find an awful lot of safety and security features in the new Grand Cherokee, too. You get the usual front and side airbags, along with hill start assist, trailer sway control, hill descent contr4ol, electronic roll mitigation and standard electronic stability control, there are new things like blind spot/rear cross path detection system which lets the driver know with illuminated icons and a chime that a vehicle is in the blind spot area of the car. To give you an added sense of security, you should know that the all new body structure’s torsional stiffness is 146 percent stiffer than the old model, and stiffer than the Lexus RX300, Mercedes ML and BMW X5, competitors all with this Grand Cherokee. And are you a media fiend? You’re in good company here. There’s the FLO TV system offers live mobile TV to consumers with the capacity for as many as 20 channels including CBS Mobile, CNBC, Comedy Central, Fox News, MSNBC, MTV, NBC 2Go, Nickelodeon and more.